Please email your photos or logos to andleng56@yahoo.com for an additional charge of $25. Commemorate that special occasion forever with our Laser Engraved Heart Keepsakes. Transform this crystal decoration by adding your own custom text and picture. Beautiful laser engraved pictures and text have a magnificent look that is sure to put a smile on their face. It is a unique gift that is guaranteed to last generations. The laser engraving will show a crisp white with the clear acrylic for an elegant high contrast. You can use this piece for a paperweight, a decoration or as a cake topper keepsake for any special occasion. 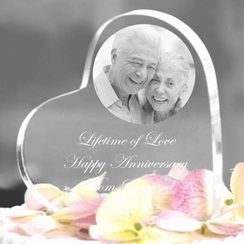 Create lasting memories of your favorite photos engraved on one of our acrylic hearts. 3/4� in thickness and 4"X4" crystal clear acrylic heart is a great gift for weddings, anniversary, graduation, birthdays, sweet 16, Valentines day, sweethearts, best friends, etc. With its timeless look, this cake topper is the perfect finishing touch to your wedding cake, mantlepiece or a paperweight on your desk. The thick acrylic heart is set on its edge. Crystal clear design and personalized engraving makes a great gift for that special someone. The Personalized Acrylic Heart Cake Topper coordinates with any wedding cake design and any wedding color theme. It also makes a great 25th or 50th anniversary keepsake. Don't forget to check out A & L Engraving's complete selection of wedding gifts, including Wedding Cake Knife Sets and Champagne Glasses.